Sister Carole Strawn was born in Corvallis, Oregon, to Kenneth and Agnes Rohner Strawn. The oldest of five children including Jim, Rick, Kathy and Cindy, she grew up in Salem and attended St. Joseph’s Grade School and Sacred Heart Academy. After graduation she entered the novitiate of the Sisters of the Holy Names. On completing her bachelor of arts in social sciences at Marylhurst College, she served 16 years in elementary education. She taught at St. Joseph’s in Salem and at Holy Redeemer, St. Ignatius, and Assumption in Portland and was principal at St. Ignatius. During this time she completed a master’s in interdisciplinary studies at Western Oregon. For the next five years Carole served as communications director for the Oregon Province after which she spent 25 years at Marylhurst University in the Marketing and Communications Department. 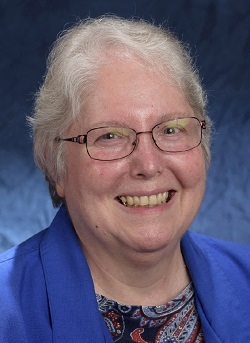 Perpetually the student and a proponent of lifelong learning, she recently completed a master of divinity (2012) and a graduate certificate in gerontology (2015) at Marylhurst. Pursing a lifetime interest, she now works at the Holy Names Heritage Center as an archivist. She enjoys the daily opportunity to “meet” the Sisters who so richly embodied the spirituality of the Sisters of the Holy Names. In addition, over her 50 years, Carole has given long-term service to many SNJM endeavors, including committees for justice and peace, corporate stand, archives and governance. She has been the editor of Ventures, the Oregon SNJM development publication, for 20 years. A person of multiple interests, Carole participates in local organizations on topics as diverse as sustainability and care of the earth, spirituality, and gerontology and elder issues.